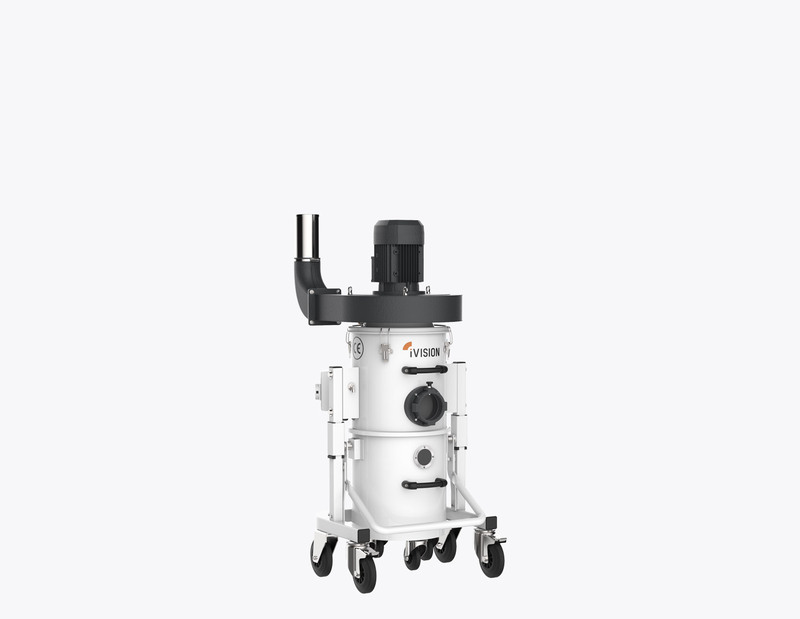 The vacuums of the iV1 Extrusion are the iVision industrial vacuums most compact and economical. They are of an efficient system, rational and silent, utilized in the world of window and door manufacturers and extruders for the industrial collection of chips collected generated by small single-head saws or circular saws with low production of chips and dust. Thanks to the small dimensions of the product, that presents very robust and solid, the vacuums of the iV1 Extrusion line are used perfectly with cutting machines, guaranteeing an excellent qualitative standards as inherent to the suction effectiveness and efficiency of filtration. The vacuums of the iV1 Extrusion line were conceptualized to satisfy every need of window and door manufacturers that have problems have tight work spaces and prefer to not engage in a large economic investment. Thanks to the iV1 Extrusion line, no professionals will be further obligated to give up high performance and reliability. Vacuums of the iV2 Extrusion line are the medium-sized models of the iVision industrial vacuums and come recommended to be used with large, single-head saws or small, double-head saws with a medium production of chips in the work environment that produces little chips and dust. They are industrial vacuums very versatile and their ideal application is for producers of doors and windows using PVC or aluminum. The attention and care given to the design of the vacuums of the iV2 Extrusion line, combined with being composed of rubost materials characterize the iVision fan industrial vacuums. iVision has established itself over the years in the world of extrusion and windows and is recognized as upholding the utmost quality, reliability, innovation and efficiency. iV3 Extrusion Industrial Vacuum Cleaners are the top best-selling models among iVision vacuums and are usually used alongside double-head saws or automatic cutting centers with a high chip production, or generally in all working fields where huge quantities of chips and dust are created. The iV3 Extrusion vacuum cleaners are some of iVision’s most high-performing items, for use with your machine tool. The study and the design research, the sturdy materials and the simple design, are characteristics of a product entirely made in Italy; a real guarantee on the industrial market. The vacuums of the iV Custom Extrusion line are born from our long experience in the industrial machinery sector, in particular in the extrusion and window and door manufacturing world, in order to fulfill the ever-growing demands of chip collection during cutting work. Every vacuum from the iV Custom Extrusion line is equipped with an M Class Filter, a filter of high quality, created purposely for this sector, that consents the collecting of at least 99,9% of suctioned materials. Thanks to the innovations applied to the vacuums of the iV custom Extrusion line, the maintenance of your machinery becomes quick and economical. The iV4 chip collectors of the Extrusion line are dedicated to intensive and continuous machining and are used alongside large double-head saws or automatic cutting centers with a high chip production. In general, chip collectors IV4 with 1000 litre storage buckets are used in all work environments where large amounts of chips and dust are produced. The world’s leading extrusion manufacturers have been using iVision line IV4 systems for several years. Thanks to the high chip collection capacity (up to 1000 litres) and the automatic lid opening system, IVision IV4 is particularly appreciated in the world of the extrusion industry.